Writing in the Wall Street Journal, the inevitable Republican nominee (let’s be honest) offered a glimpse at his own strategy for stopping what looks more and more like an Iranian nuclear weapons effort. Romney vows to “restore the regular presence of aircraft carrier groups in the Mediterranean and the Persian Gulf region.” He says he will increase military aid to Israel, throw in his lot with Iranian dissidents, put new sanctions on Iran, all to “send an unequivocal signal” that the U.S. won’t permit Iran to go nuclear. Obviously, there’s some wiggle room in that statement. (Who knows what a “course of folly” looks like, or whether or not a military strike is “available?”) Still, it’s a sizable shift from 2007 to 2011. Instead of committing (however loosely) to military action, Romney will now merely threaten Iran. Why the relative dovishness from Mitt 2.0? Perhaps it’s because he’s closer to the presidency than he was during the last election cycle; would-be occupants of the Oval Office need to be more careful in their foreign policy pronouncements. Perhaps it’s that an aggressive, expansive, interventionist approach to global affairs isn’t quite as popular in today’s Republican base as it was in yesterday’s. Either way, it’s part of a larger pivot that Romney has made — away from neoconservatism, and towards something more reserved. Back in 2007, Romney proposed a wide-ranging “Marshall Plan” to wholly reshape the Middle East. His current Mideast policy embraces the Arab Spring revolutionaries, but don’t go as far in terms of U.S. economic aid. 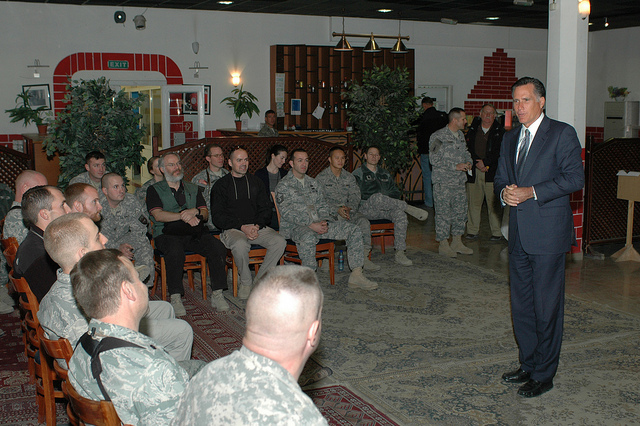 In 2007, Romney was full-throated in his support of more troops in Iraq. Today, there’s “public evidence of ambivalence” about the war in Afghanistan, as Eli Lake observed in The New Republic. “One lesson we’ve learned in Afghanistan is that Americans cannot fight another nation’s war of independence,” Romney said in a June debate. In his Journal op-ed, Romney, who recently pushed for a radical expansion of the American Navy, doesn’t explain how adding U.S. aircraft carriers to the Gulf will actually stop Iran from going nuclear. “Only when the ayatollahs no longer have doubts about America’s resolve will they abandon their nuclear ambitions,” he writes. Except that Iran is way paranoid about a hostile U.S. already, and it’s not curbed the mullahs’ nuclear ambitions. Romney also neglects the harsher things Obama’s done on Iran. The new U.S. missile defense system in Europe — which Romney derides – is designed to stop Iranian missiles. The CIA for years has disrupted the Iranian nuclear program’s supply chain. Iranian nuke scientists have lately died mysterious deaths. Romney also doesn’t mention Stuxnet, the worm that messed up Iran’s centrifuge control system – which may be a joint U.S.-Israeli cyberweapon. None of this is to say Obama’s Iran policy is working. Most importantly, Iran may indeed go nuclear on his watch, after Obama argued in 2008 that a dovish approach would yield geopolitical dividends. Even Obama’s own defense secretary and former CIA director doesn’t think sanctions will stop the Iranians. If there’s a logic to which Mideast dissident movements Obama will scorn and which he’ll wage wars to support, that logic has not be made apparent to anyone outside the White House. Eighteen months after Obama kept largely silent about the protests rocking the U.S.’ biggest enemy in the region, he spoke up loudly in support of the movement which overthrew one of America’s longest-standing friends, Egyptian president Hosni Mubarak. If that’s Romney’s criticism, it’s fair. But if Romney’s problem is with Obama’s dovishness, it’s odd that Romney 2.0 is more dovish than Romney 1.0. All of which raises the question of what Romney 3.0 — President Romney, that is — would actually do about Iran.